Jacob Anderson, front center, is flanked by his mother, Jennifer Anderson, and father, Joe Anderson. From left in the back row are: football coach Phillip Townsend, brother Joey Anderson and travel baseball coach Marshall Betts. It’s many a young kid’s dream to be able to play their favorite sport collegiately. Indian River High School senior Jacob Anderson has made that dream a reality. 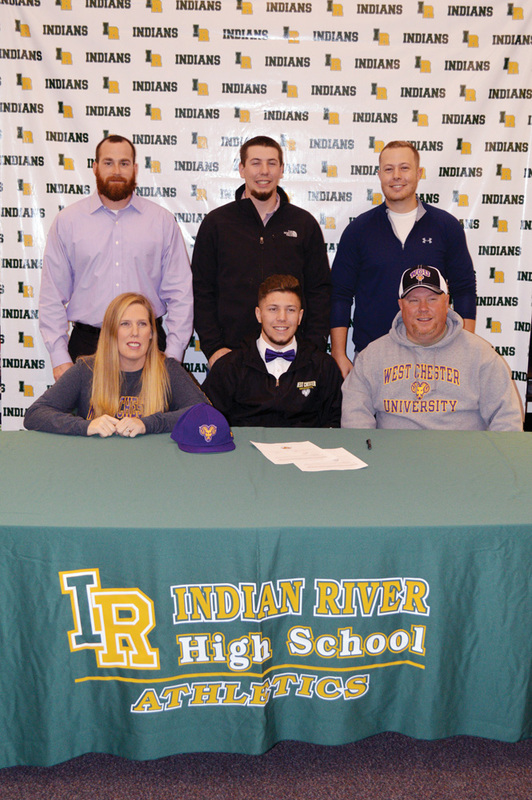 Last Thursday, Nov. 15, supported by several members of his family and friends, he signed his National Letter-of-Intent to continue his academic and athletic careers at West Chester (Pa.) University, playing baseball. And the Golden Rams’ being a successful program was certainly attention-grabbing. The Indians senior will miss his senior baseball season during his recovery, but he said he is eagerly looking forward to being all healed up in time for the Rams’ fall ball season in 2019. Anderson said he was sold on West Chester after also considering Wilmington University and Salisbury University, as well as some other schools farther away. The West Chester program — which also won the national championship in 2012 — finished 44-11 overall and ranked No. 19 last season. Head coach Jad Prachniak will be in his seventh season at the helm of the Golden Rams program in 2019. He is the youngest head baseball coach to ever win two Division II national titles. He is 204-92-1 (.689) overall in his WCU career. Anderson will be heading into school undecided as to his academic major, but he said he is leaning toward a major in sports medicine. He, along with classmate J.J. Killen, played for the Delaware South team in the Carpenter Cup in Philadelphia this past spring. Anderson batted 3-for-5 with a home run and a couple RBI during a scrimmage leading up to the Cup games, while batting leadoff and playing centerfield. He is expecting to play outfield at West Chester as well.